This is a rock-solid stock with a great dividend, trading at a good price, with the opportunity for long-term growth. The stock market is near all-time highs and stocks trading for what we would traditionally consider a value, like a low P/E ratio, are getting hard to find. 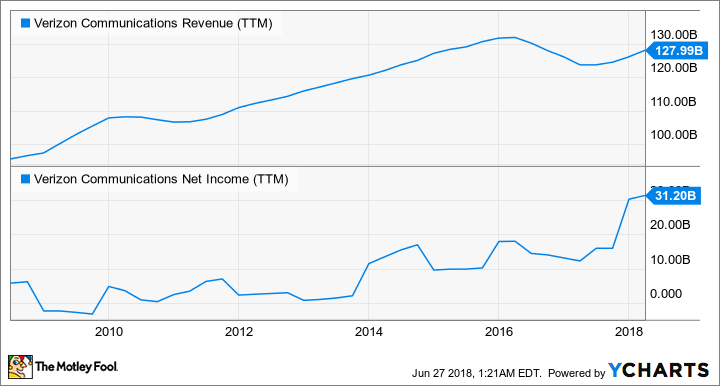 One company that looks like a value whether the market records continue or not is wireless giant Verizon Communications (NYSE:VZ). The company has the largest wireless customer base in the U.S., a high dividend yield of 4.9%, and trades for less than 11 times 2018 earnings estimates. But the good news for investors doesn't end with value. What I really like about Verizon is that I think it's just setting itself up for its next growth phase with its 5G network and that could propel the stock forward for the next decade. Verizon's foundation is in its U.S. wireless network, which is among the best in the country. It primarily competes with AT&T for high-end wireless services, while T-Mobile and Sprint vie for value-conscious customers. Over a long period of time, being a premium supplier has been very beneficial for Verizon, which you can see below. The company has grown consistently for the past decade with the exception of a blip in revenue in 2017 when it tried to compete with discount carriers on price. It has seen net income consistently rise as well. VZ Revenue (TTM) data by YCharts. It may seem surprising given the proliferation of mobile devices, but Verizon also continues to add retail connections at a solid clip. Over the past year, it has added 2.3 million net retail connections to end the first quarter of 2018 at 116.2 million connections. And that may be scratching the surface of its long-term potential. Verizon is already a leader in rolling out its 5G wireless network, which it is currently testing in limited markets today. 5G is roughly 50 times faster than current 4G networks, which will open up a new world of connections, from the home to vehicles to virtual reality. The first product expected to be launched by Verizon is a 5G home internet offering. Rather than cable, DSL, or fiber, customers will be able to get internet wirelessly in their homes, opening up millions of potential new connections for Verizon. Autonomous vehicles are another opportunity for growth for Verizon's 5G network. Fleets of autonomous vehicles aren't yet on the road, but big names like General Motors, Uber, and Alphabet have their sights set on making a car ride without a driver commonplace in the 2020s. 5G will also enable new technologies like streaming virtual reality content, which is currently too data-intensive for mobile networks. Connected devices like watches, drones, and smart home systems are just a few of the devices that could benefit from faster wireless connections, opening up a world of innovation. There are fair criticisms of Verizon today, like the fact that its sales growth has stalled and that it's now competing with low-cost providers for customers. But in the long term I think the company is well-positioned to regain a top market position in 5G wireless networks. It'll open new markets, like home Wi-Fi, where Verizon has never really been a player. With shares trading at a low forward P/E ratio of 11 and a dividend yield of 4.9%, Verizon is the one stock I would buy on the market today. It's much better-positioned for long-term growth than most investors are giving it credit for.